On December 21st, Harrison Middle School from Mt. 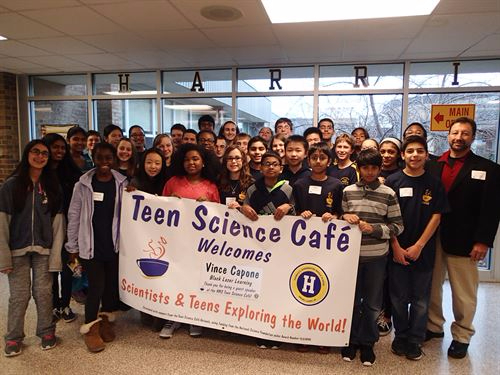 Laurel, New Jersey had our very first Teen Science Café event! There were many decorations, lots to learn, and a large group of teens to meet the guest speaker, Mr. Vince Capone from Black Laser Learning. Teen participants enjoyed the snacks and eagerly awaited to hear Mr. Capone talk about his knowledge of marine technology and share some of his experiences. Mr. Capone gave attendees an inside look at marine technology through the use of engaging videos and a thought-provoking presentation. Following Mr. Capone’s presentation was an activity in which the attendees were tasked with identifying various underwater items from sonar images. The teens did well, with most being able to identify at least a couple of the underwater sonar images shown.